I was recently elected chair of the Princeton Shade Tree Commission. One of our first tasks this year is commenting on proposed changes to the Princeton Shopping Center's parking lot. Some existing trees will be removed and new ones planted as part of a reconfiguring of the parking and access lanes. Because we often aren't conscious of what trees we pass as we drive or bike around town, it's useful to document what's already there with photos. This post, then, is basically an inventory of what exists now, with a midway reflection on how we tend to be individually thoughtful but collectively thoughtless when it comes to the world we live in. Along Harrison Street, there's a grove of pines and a long line of sycamores. The southwest corner of the shopping center has three large, healthy locust trees and a few struggling weeping cherries. One big honey locust stands near the old gas station, along with a dense hedge of winged euonymus--a non-native shrub that has invaded the local nature preserves. Though the architectural drawings are hard to read, it looks like the tree slated for removal on the west side of McCaffery's is the struggling pine tree closest to the building. This treeless zone along the west side will be redone. Nearly all the existing "islands" in the parking lot are planted with red maples, a native bottomland species that is actually doing quite well here. Trees like red maples that are adapted to the low-oxygen conditions of wet ground often do well in parking lots and along streets, where the soils are low in oxygen due to compaction. Though the whole parking lot needs a facelift and more shade, it's the backside that particularly needs a "revisioning". Trees growing under the powerline are getting hacked up. The one extending way out may look contorted, but at least it's providing some shade over the pavement. One question is whether the islands could be redesigned to receive runoff from the pavement, thereby providing some water for the trees, and capture and filtration of at least a small portion of the massive stormwater runoff. The shrubs lining the "lower east side" of the parking lot are full of trash. In a way, this blight is a good sign, in that the plastic bags and other refuse are being prevented from heading down Harry's Brook into Carnegie Lake. If it were someone's job to clean up this mess periodically, this unintentional "filtration" of litter from the stormwater would help reduce plastics pollution of the watershed. While I was taking these photos, drivers passing by were very polite and thoughtful, slowing down or stopping in case I was trying to cross the road. It's a good example of how people as individuals tend to be kind and generous, while we are at the same time collectively creating problems like all of this degradation of Harry's Brook via litter, pollution and flooding. The parking lot is in one of the headwaters of Harry's Brook, and you can see that a lot of stormwater runoff (polluted with oil, heavy metals, salt, and whatever else is left behind by car culture) flows straight into the creek, completely unfiltered. The building roof and parking lot shed massive amounts of water during heavy rains, all of which charges down Harry's Brook, flooding residential neighborhoods before emptying into Carnegie Lake and continuing to the ocean. Princeton contributes to the pollution of the oceans like every other community. The shopping center was built before any stormwater controls were required. The south side of the parking lot, bordering the back side of houses on Clearview, has a mix of trees growing along the fenceline. And more islands with red maples provide a tiny bit of shade in the vast expanse of blacktop. These islands will be removed and shifted to accommodate a change in traffic pattern, meaning that the existing trees will be toast. Figuring out what sorts of trees other than red maples can grow adequately in such a tough location has been a big question. Honey locusts are doing well elsewhere in the parking lot. Hackberries have been mentioned, and an Asian species, Zelkova. 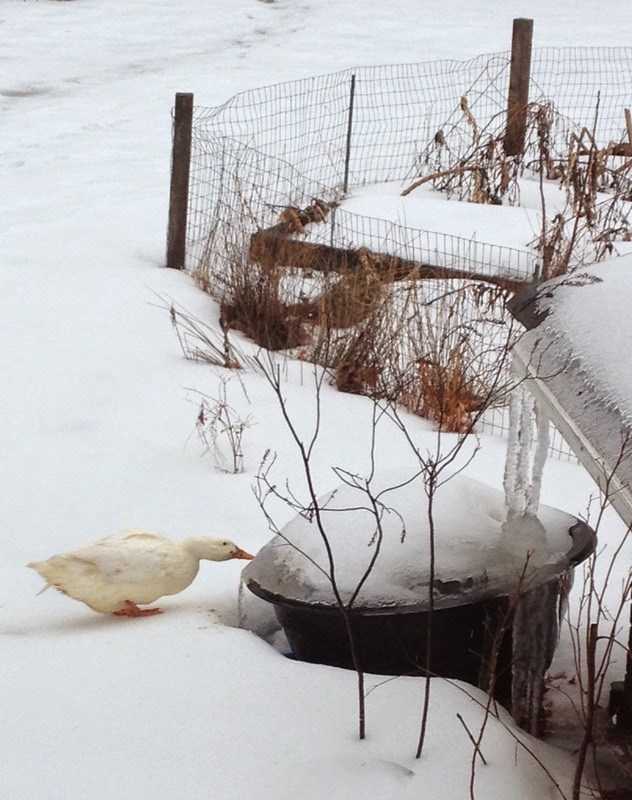 Our Pekin duck has been finding more reason to venture out of the coop this week. There's mud to probe with its beak, and the luxury of a bath in one of our backyard ponds swelled by snowmelt from neighbors' yards. She had no problem breaking through the thin layer of ice left by last night's freeze. Earlier in the month, finding water in its liquid state was more of a challenge, as she took sips from the fillable-spillable minipond catching water from the roof. She keeps a sharp eye out for hawks, turning her head to get a better look at the sky. Usually, that turn of the head means something's flying over, be it a vulture, crow, hawk, or a jet headed into Newark Airport. Meanwhile, the duck's companion, a chicken of similar feather, was laying another robin's-egg-blue egg. We often get two a day now, as warmer temperatures and longer days have broken the winter drought. Ducks and chickens made multiple appearances in movies this weekend at the Princeton Environmental Film Festival, particularly in the excellent documentary on permaculture, "Inhabit". The ducks were said to be excellent at keeping the slug population down on an outdoor shitake mushroom farm, and the chickens happily batted cleanup in one of the crop rotations, eating any seeds that eluded harvest. One theme on this last weekend of the Princeton Environmental Film Festival is how to bring nature back into children's lives on a more consistent basis. To understand what an extraordinary challenge this is, consider the story a teacher at a local daycare told me yesterday after one of the movies. The kids in the daycare were having ongoing fun playing in a mud puddle on the playground. They took delight in an earthworm and other creatures they found there. Then an inspector came and declared the puddle was a violation and had to be filled in. We think of accreditation as a comforting thing, and yet it comes at a price, paid by the kids themselves. The film we had just seen was "School's Out: Lessons from a Forest Kindergarten", about a Swiss "wald" kindergarten that is completely outdoors, rain or shine, winter or spring. The kids adapt to the weather, play in the woods, make stuff, learn to get along. While the American school system keeps kids indoors and cuts back on recess in order to launch young kids into academics, the Swiss wait until age seven to begin formally teaching reading, writing and math. By age ten, according to the movie, the Swiss kids have caught up. The closest thing in Princeton to this approach would be the Waldorf School. Other schools represented in the audience were the Princeton Learning Cooperative, which is based next to Herrontown Woods in Princeton, and a new school that is evolving out of programming at Hopewell's community center, called Hope and Wellness. The movie provides a vivid contrast between American indoor education and the forest kindergarten approach that is offered as an option in areas of Europe. The film's trailer provides a good sense of it. By focusing on active outdoor play and learning, kids develop a core of skills that serve them well through the rest of their lives. Gross motor skills become much better developed, kids learn how to get along and problem-solve, and see nature as a source of wonder rather than something alien to fear. The expensive playgrounds we construct begin to look sterile and impoverished compared to a woods with its endless variety of leaf litter, trees to climb, and creeks to explore. Other related events at the library this weekend are a child-oriented presentation on raingardens that includes a reading of Jared Rosebaum's The Puddle Garden (sounds like something that would get playground inspectors nervous), and two showings of Project Wild Thing, an excellent movie about a father who decides to become nature's marketing agent. Mark Johnson, who served as Princeton's animal control officer for more than twenty years, was recently offered a separation agreement by the municipality. Animal control services have been outsourced to Montgomery. The reason for the separation, according to articles at PlanetPrinceton.com, has nothing to do with his field work but instead with record keeping and his handling of rabies vaccines supplied by the state. Other decisions about his employment remain shrouded in mystery, as far as I know. He was shifted from the health department to the police department a couple years ago for no clear reason, and within the last year or so I read that he was no longer allowed to make house calls to assist homeowners with animal control issues. His house calls were a great service. My interactions with Mark were always positive. He helped us get raccoons out of the historic Veblen House attic, and his policy on keeping chickens in the backyard was a pragmatic one, allowing chickens (no roosters) as long as bordering neighbors approve. He was my go-to person for information on coyotes and other wildlife in Princeton. He also had to endure criticism coming from those who oppose Princeton's deer policy--a policy that, given that we long ago eliminated the natural predators necessary to control deer population, has greatly benefitted Princeton's forests, dramatically reduced car accidents, and insured a better balance between deer numbers and available habitat. His was not an easy job. I don't profess any blind adoration of trees. Though they provide summertime shade, coolness and beauty while absorbing carbon from the atmosphere, they also tend to steal sunlight from some of my favorite wildflowers and vegetable garden. But I just added another benefit of trees to the long list the other day while crossing Franklin Street in late afternoon. The crosswalk I was on was clearly marked, yet the car approaching from the east wasn't stopping. I pointed at the crosswalk markings with a touch of righteousness, as if to say "Puh-LEEZE! Don't you know cars are supposed to stop for pedestrians?" The driver stopped, and then I realized that he had been slow to see me because he was driving straight into the late afternoon sun. Late winter and early spring can be a dangerous time to drive, because the sun is regaining prominence yet the trees haven't leafed out to shield us from the sun as it drops towards the horizon. With the time change, the low angling rays are in full force during morning school traffic, when streets near the high school become crowded with drivers rushing to drop off students and get to work on time. Streets become a little safer when the trees leaf out. There's a drama going on right now, some 2000 miles south and west of here, that will affect our summer to come. Though we're still caught in snow, the monarchs are struggling to begin their journey north from their overwintering sanctuary in the mountains west of Mexico City. I say "struggling" because they were doused by two days of heavy winds and rains just when they would normally head north en masse. Journey North on learner.org provides weekly updates that described bustling activity in the first half of March as the Monarchs flew in crowded masses on the forested slopes, then mated prior to beginning migration. Though last summer's ideal conditions allowed the population to rebound somewhat from the previous year's record low, numbers overwintering were still only a fifth of what is considered average--the whole eastern migratory population covering a mere three acres. This map shows how the monarchs are concentrated in El Rosario, the main tourist location, with the rest scattered at various other locations nearby. "The monarchs would come out of the trees each time that cumulus clouds covered the sun. They reached almost unbelievably dense numbers, flying out over the llanos. The trees were nearly emptied at such times. Literally every cubic foot of air held at least one monarch." A report of "Massive mating..." comes on March 12. But the next week's report is less sanguine. By March 16, the leading edge of the migration typically crosses over the Rio Grande into Texas, but this year the departure has been delayed. A March 19 update reported that cold weather is delaying departure, and "Terrible weather at the sancturies" was reported on March 16, as heavy rains and strong winds plagued the sanctuary for two days straight. Five decades ago, we didn't even know where the Monarchs overwinter. Only when things start to go wrong does one have to start figuring out how something works, whether it's a car engine, one's body, or a wondrous annual migration. What once was dispensed free of charge by a generous nature now might not survive without human intervention. Working in local habitats, I've seen what nature can do when a restored balance unleashes the native growth energy. The Monarchs are one more example of the tremendous capacity of nature to thrive, if only we give it a chance. 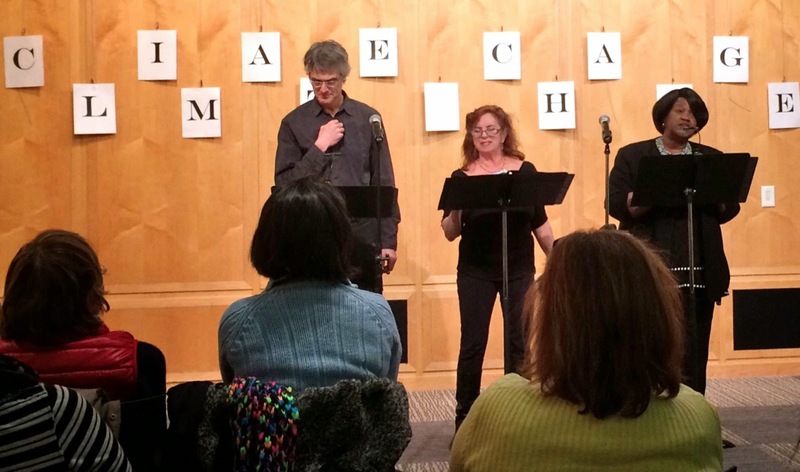 Friday the 13th was one wild and crazy night at the Princeton Public Library as the Climate Change Cabaret launched, if not into space, at least into the space better known as the Community Room. Seven actors, a Princeton High School acappella group, a jazz pianist, and three singers bearing an uncanny resemblance to Doris Day filled the full house with wonder, joy and laughter--perhaps not the sort of response you'd expect from material dealing with climate change, but there it was. The evening began with a piece called Complaint Training, in which The Three Grouseketeers offered to provide instruction in how to rant higher, rant lower, rant longerrrrrr. Carbon made an appearance as a seductive renaissance atom with a dark side. A guy struggled to extract himself from his relationship with a car with an addiction. Mr. Sustainable found a joyous and gallant way to make peace both with his spouse and future generations, after a long-running thermostat war. A Plan to solve our earthly problems arrived just when all seemed lost, sustainably wrapped in a cardboard box. And for the singalong, Doris Day appeared in triplicate to lead a stirring rendition of "Que SoLAR, SoLAR, the future is ours you see, if only we're carbon free." The actors who breathed life into the scripts, in alphabetical order, were John Abrams, James Degnen, Kim Dorman, myself, Cheryl Jones, Basha Parmet, and Eric Schroeder. Landis Hackett led Princeton High School's Around Eight acappella group in sustainable versions of Turn (Out) the Lights and Thrift Shop, along with something I wrote called 99 Too Many Cars On the Road. Sustainable Princeton provided two of the three Doris Daze (my plural of Day, though I hear they're going to call themselves the SoLAR Sisters)--Christine Symington, Diane Landis, and Jeanne Devoe. The sponsor of the event, the upcoming Princeton Environmental Film Festival 2015, known to many of us as PEFF, debuted its film festival trailer. And the Princeton Environmental Institute came through with a handy poster showing the stabilization wedges that might steer us away from a very risky course. I'd also like to thank Steve Gaissert and the actors he was able to summon for a first reading of the material this past January. Their encouragement and comments provided much needed momentum. Thanks to all, and to PEFF's Susan Conlon and Kim Dorman, for their assistance and faith in this project. First and third photos by Karla Cook and Susan Conlon. When snowmen take over the world, they will lounge comfortably on the patio in snow-cushioned chairs, munching on snowburgers. and, when there is sno more for a snowman to do, take a snooze and dream of snowstorms to come.